A group of at least 18 enterprising kids at an Alaskan middle school this week took control of more than 300 classroom computers, after phishing their teacher’s account details and awarding themselves administrative rights. It seems the cheeky blighters asked teachers to input their account details to accept a false software update. The teachers at Schoenbar Middle School, for 12 to 13-year-olds obliged and a little later pupils began to complain that their machines were not responding to instructions. According to the BBC, the computers affected have now been seized, but nothing has been said on the fate of the unruly pupils, if indeed it’s known who they are. “I don’t believe any hardware issues were compromised,” principal Casey Robinson told community radio station Ketchikan FM. “No software issues were compromised. I don’t think there was any personal information compromised. Now that we have all the machines back in our control, nothing new can happen,” he added (famous last words spring to mind). He went on to say that the school would now carry out a review on how school computers are maintained. 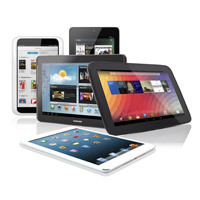 Worldwide tablet sales have soared in the first quarter of 2013, according to tech analysts IDC and their Worldwide Quarterly Tablet Tracker. Compared to this time last year, tablet sales have risen by 142.4%, with both Apple and Samsung performing better than analysts expected. Even Windows Surface tablets saw a slight improvement, which is encouraging for Microsoft following the failure so far of the Windows 8 OS. However, it’s thought that this may not be sustainable due to the demand for smaller screens, which is currently a big market driver. “Sustained demand for the iPad mini and increasingly strong commercial shipments led to a better-than expected first quarter for Apple,” said Tom Mainelli, Research Director, Tablets at IDC. Top spot for manufacturer this quarter went to Apple, with Samsung increasingly snapping at their heels, thanks to the success of their devices over the past year or so. ASUS managed to make third place, with Kindle devices dropping into fourth due to “highly seasonal sales”. When it comes to mobile OS’, Android remains the world’s favourite mobile operating system, with a market share of 56.5%, followed by iOS with 39.6% and Windows trailing with 3.3%. BlackBerry failed yet again to make an impact and the figures have been published just days after boss Thorsten Heins predicted that tablets would be obsolete by 2018, in an interview with Bloomberg. He also said that BlackBerry have no plans to manufacture another tablet following the poor sales of the Playbook, which launched in 2011. The world’s favourite social network is not such a winner as it has been in the past, as it’s now looking to be on the wane in the western world, with the latest figures showing a drop of 1.4m active users in the UK last month, accounting for a 5% drop. The states has seen a similar drop of 4%, or 6m users no longer actively logging on to the social networking site. This comes on top of a six-month slide in which Zuckerberg’s baby has lost an estimated 9m monthly US users and 2m UK. However, the site continues to see strong growth in emerging economies and you have to wonder how many more people in the UK and US can physically join the site (or would want to). Last year Facebook hit the landmark 1bn users and despite investor worries surrounding monetisation, the latest figures from the company have looked pretty healthy. It’s still working on becoming a mobile company too and last month saw the launch of Facebook Home and the HTC First, which is the only mobile phone with Home integrated into the operating system. However, Home has come under scrutiny by privacy watchdogs and early user reports don’t look encouraging. Having used it briefly myself, I can say I found it very confusing, although I wasn’t aware what it was at first, having picked up a family member’s phone. I can’t say it provided me with much incentive to download the Android version and according to said family member, it’s extremely intrusive, even as a standalone app. I was going to bring you all the special treat of seeing Micky Bubbles aka Michael Buble singing in the subway this week, but the Guardian chart topper looked much more interesting. Or strange, to be more exact. We’ve all seen the singing goats and now there’s Daft Punk – Goat Lucky (Feat. Pharrell Williams) a very odd, but reasonably funny mash-up with goats and disco. Enjoy! MySocialAgency is a modern digital marketing agency based in the UK with teams in Leeds and London. Get in touch today to learn more about our services.